I have found a new love for Polenta. It is is pretty much summed up as the ”Italian porridge”. It contains a number of vitamins and minerals. To name a few: magnesium, calcium, iron, phosphorus, sodium, zinc, vitamin B and vitamins A and E. After eating polenta fries and winter warming creamy polenta dish the other week, I thought why not recreate my own recipe? It seems like polenta is the current healthy eating trend right now. What is Polenta? It is the fancy word for cornmeal basically. It is derived from corn and so makes a great gluten-free option. With that being said, it can cause you to become bloated, it doesn’t affect everyone but if corn doesn’t agree with you, then maybe this recipe isn’t one for you to try. Cornmeal and polenta in my view are interchangeable. Any form of coarse cornmeal is polenta. I wouldn’t use ground powder form of cornmeal. You can buy big packs cornmeal from cash &carry type stores or polenta from Wholefoods or Holland and Barrett. Now that you have figured out what polenta you will use, the next step is the type of liquid you will cook it in. You can cook polenta in three different forms of liquid: stock, milk or water. Milk is a great option if you want to make the dish creamy. For this recipe I used Bouillon stock. 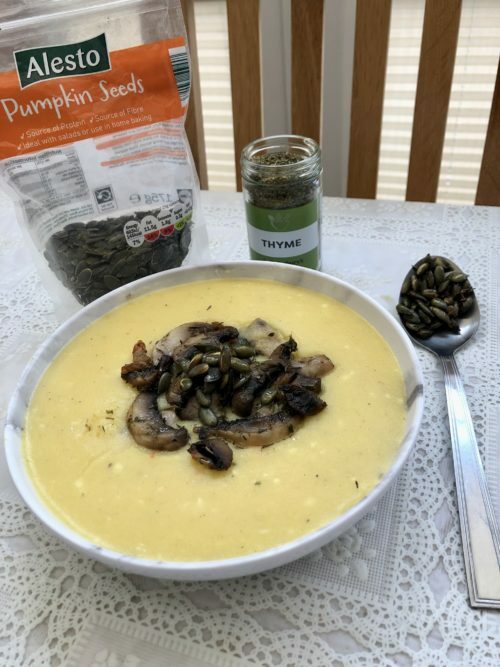 I am huge fan of mushrooms and pumpkin seeds so I combined the two for the topping. You can use roasted beetroot or vegetables, whatever you fancy. Before I dive into the recipe, have any of you ever tried polenta fries? OMG, the ultimate Winter warmer comfort food, especially when dipped in mayonnaise. You can make these fries, using the recipe below for making the polenta and press into a tin and cut into fries shape and bake in the oven for about 45 minutes. Seriously good. My favourite are the Pizza Express version. Ok so here is the ultimate Winter warmer creamy polenta recipe. Simmer and cook for about 40 minutes on low heat. If it gets too dry, add more stock. Your aim is to get it into a creamy texture. Whilst this is cooking, chop your onions with a few springs of thyme and cook with the mushrooms and olive oil in a pan for about 5 minutes. Add your chopped nuts and stir with some salt and pepper. When polenta is almost done, add the grated cheese and stir for a further 5 minutes. 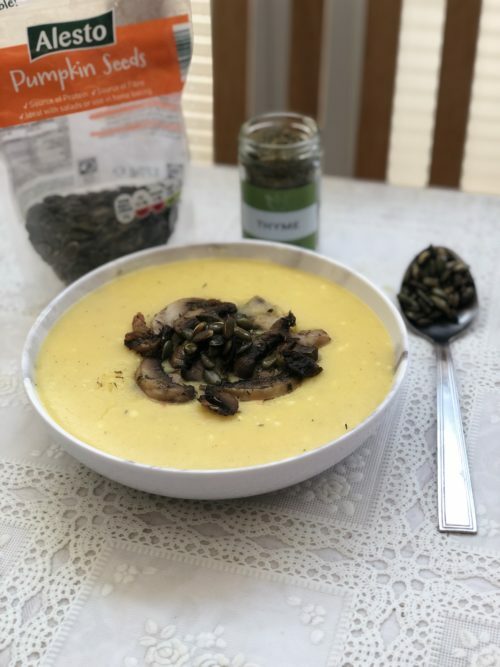 Place in bowls and top with the the mushroom mix and pumpkin seeds. Easy and simple Winter warming, creamy polenta recipe. It makes a great weekday meal, just stick it on the cooker and leave it to cook whilst you get busy with your evening. I would definitely try the polenta fries. They are DIVINE!